For the main entry about the radish, click here. Radishes that make it after a disaster, earthquake or other, show us an example of the resilience of nature and a strong will to survive (konjoo). A radish has grown up in a crack formed by an earthquake on an island off the coast here, evoking memories of the renowned "gutsy radish" that has become known around the world. A police officer found the radish Tuesday sprouting up through a crack in the earth apparently caused by the temblor in 2005 on Genkaijima, an island off Fukuoka. "We hope the radish will give island residents the guts they need to keep on battling," the officer said. Genkaijima's gutsy radish has brought back memories of Dokonjo Daikon, literally the gutsy radish, a vegetable that earned praise when it grew up and forced its way through asphalt in the Hyogo Prefecture city of Aioi last year. Dokonjo Daikon -- and reaction to its appearance -- has attracted international coverage. It has been hailed for providing an example of resilience through adversity. Aioi Municipal Government officials are currently trying to extract the original Dokonjo Daikon's DNA to try and grow similarly durable radishes. A Japanese radish that has pushed its way up between the asphalt on a road and a roadside ditch has gained attention as Tokyo's version of the "dokonjo daikon," or "gutsy radish." The radish appeared in a residential area of the Tokyo city of Higashikurume, surprising residents and local government officials. "I have no idea how the seed got here," a puzzled Higashikurume Municipal Government worker said. Radishes sprouting up in unusual places have been reported all over Japan, but the area in Higashikurume where the radish was found is lined with supermarkets and apartment blocks, and there are no fields nearby. The radish, which measures about 4 centimeters in diameter, apparently started growing under the asphalt and pushed up the wooden lid of a ditch as it got bigger. Its leaves span the width of a human hand and the radish can been seen from the road. 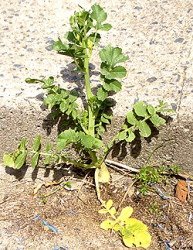 The first radish to receive nationwide attention was a one growing through asphalt on a sidewalk in Aioi, Hyogo Prefecture. Impressed with its strength, Residents named it "Dokonjo Daikon" (gutsy radish). However its top was later lopped off by a vandal, causing it to wither. The radish was taken to an agricultural research center after the attack, and officials are waiting to see if it can be grown again. 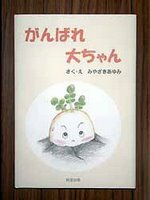 The story of Dokonjo Daikon, a Japanese radish that gained nationwide attention when it was found poking up through asphalt on a road here, has been turned into a picture book. "We want to reproduce the radish and add a new page to its history," an Aioi Municipal Government official said. The author, Ayumi Miyazaki, 33, took two months to complete the book, which she hopes will leave impressions of the vitality of the radish as it grew through the asphalt, and of the people who kept watch over it. Residents nicknamed the radish "Dokonjo Daikon" (gutsy radish), being impressed with its strength. Unfortunately, however, its life was cut short when a vandal decided to lop its top off. Dai-chan, as the radish is also affectionately referred to, was later separated into its leaves and stem, and efforts are being made to grow a copy of it. the radish story reminded me of a haiku moment from 1996.
i was spending the day driving from plano texas to pecos new mexico to finish the last two weeks of a six week course in spritual direction at a benedictine monastery. the sun was playing peek-a-boo with the clouds. the grass was covered in pink and white tiny, native morning glories. they crept into the cracks in the asphalt at the edge of the road. and it also put me in memory of the sidewalk cracks outside every indian restaurant. the restaurants put out big bowl of fennel seeds. patrons who like fennel take a big pinch of the seeds on leaving and chew them. always, if you look down, outside the restaurant, the feathery leaves of baby fennel plants fill the cracks in the pavement. Ahh Daikon! That's the name I was looking for just the other day. Some Sikh friends posted a picture of three or four Sikhs holding a Daikon Radish, several feet long! I often buy it from my friendly local Chinese Supermarket under the name Mooli, or Muli, I love it shredded as a side dish or added to just about any savoury dish!Thanks for finding a lost word for me Gabi San.